Heat oven to 325°F. Wrap outside bottom and side of 10-inch springform pan with foil to prevent leaking. In small bowl, mix cracker crumbs and 1/4 cup sugar. Stir in butter. Press firmly in bottom of pan. Bake 12 to 15 minutes or until set. Meanwhile, in large bowl, beat cream cheese, 1 cup sugar, the vanilla and eggs with electric mixer on medium speed until smooth. Beat in sour cream. Bake 1 hour 5 minutes to 1 hour 15 minutes or until center is set. Cool 15 minutes. Carefully run metal spatula along side of cheesecake to loosen. Cool completely, about 1 hour. Cover cheesecake; refrigerate at least 4 hours. To serve, carefully run metal spatula along side of cheesecake to loosen again; remove foil and side of pan. Spoon remaining pie filling over cheesecake. Garnish each slice with a fresh strawberry--a welcome treat during the winter! 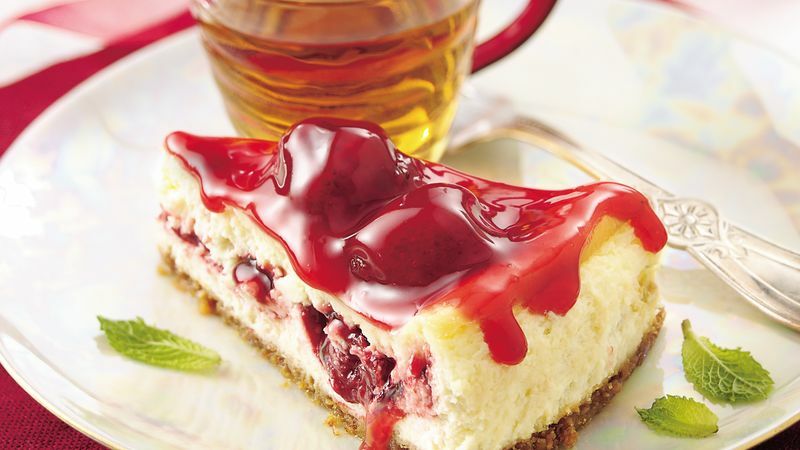 Vary the pie filling and end up with a new cheesecake! Cherry, blueberry, raspberry, what's your fave?